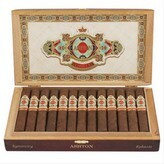 The Symmetry line from Ashton was a long-awaited product that finally was available for retail in 2006. It was delayed due to various incidents, not the least of which was a fire in the Arturo Fuente factory where the cigar was to be made, setting back the project a few more years, but for anyone who waited with baited breath for the cigar, it is well worth the wait. From the beginning, everything about this cigar announces that this is no regular Ashton line, not your Ashton classic, but rather a stand-out product that must be treated and respected as such. The Ashton Symmetery Robusto does not use the normal tobacco that Ashton uses, but rather a combination of fillers and binders from various lands to produce the flavor it provides. The filler is Dominican and Nicaraguan, all selected by the Fuente family for its quality and flavor, and the binder is likewise Dominican in nature. The wrapper is an Ecuadorian Habano wrapper, resulting in a medium-full cigar that will not disappoint any seasoned smoker, but is still approachable to a novice cigar lover. When first you clip the cigar, you smell spice, cinnamon, leather, fruit, and even a hint of the wood where the tobacco likely aged. Upon lighting the cigar and taking a few good puffs, you’re greeted with a citrus and pepper flavor, with notes of wood, cream, and leather. As you smoke more, you begin to taste the flavor of chocolate and coffee, but just a hint, leading into a nutty flavor with a toasty element to it. 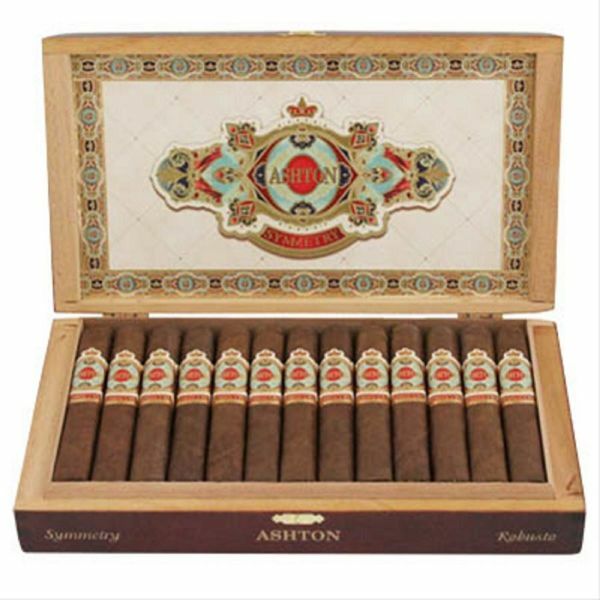 The cigar is creamy and pleasant throughout, and if you’re a fan of Ashton cigars or of My Father blends, you will not find yourself regretting the purchase of this 5 inch by 50 ring gauge cigar.